C64 Snoopy (unknown) in 08:45.91 by EZGames69. Snoopy is a pet of Charlie Brown's, the everlasting loser and the main character of the "Peanuts" comic series. Snoopy only behaves species-appropriate. Most of the time he lies on the roof of his dog kennel and abandons himself to philosophical thoughts while waiting for the food. 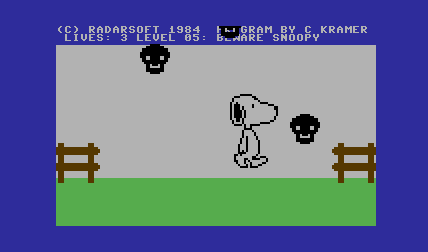 In 1984, he was dedicated an own C64 game Snoopy. A game from a time when Jump & Runs found their feet, it is about steering Snoopy through 20 tricky levels. If you have made it, you restart at level 1 only with higher speed. The obstacles can be simple holes, moats, laser beams and more.